he Plow that Broke the Plains was an enormous achievement for a first time filmmaker. It was representative of many of Pare Lorentz' greatest concerns and interests. It was a film that he had hoped to make for several years before the opportunity to work for the Department of Agriculture appeared. In a lucky coincidence, the subject of the Dust Bowl was, at the time that Lorentz was hired by the Department of Agriculture, appropriate to both of their purposes, and the film was completed in 1936. It was the first film that the U.S. government had ever produced for commercial release and distribution. As he also so masterfully demonstrates in The River, Lorentz used several different techniques in combination to create a film that was both a celebration of the American mythos and an indictment of American misuse of the natural environment. Lorentz was clear in his charges that the misuse of the country's resources was the major factor in the creation of the Dust Bowl which was at that time ravaging the Great Plains and bringing hardship to thousands of families. The message was equally clear that Americans must return to the more balanced relationship with the land that had existed in the past. From the very beginning of his work for the U.S. Government, Lorentz' projects were mired in controversy. Opponents of the New Deal felt that the money being spent of these projects could be better spent elsewhere. The Hollywood studio system had always had a contentious relationship with Lorentz, owing to the highly critical book he had written, Censored: The Private Life of the Movies. Lorentz problems with the commercial movie industry were exacerbated by the perceived threat of financial competition that films produced for commercial release by the government posed to that industry. The combination of these two factors created significant problems for Lorentz, including his being barred from access to stock footage owned by the studios. But Lorentz had far greater problems with the government than with Hollywood. Because Congress was hostile to the idea of the Government producing films, the fate of Lorentz projects was constantly in jeopardy, and there were times that he worked without pay as Congress debated whether or not he should be allowed to continue. As it was, even when he was salaried, he made 18 dollars a day, less than the cameramen working on the project were. He paid some of the costs of completing and marketing The Plow That Broke the Plains out of his own pocket. The film had its first showing at the White House in March of 1936 and its official opening, after several private showings, at the Mayflower Hotel on May 10, 1936. The event was sponsored by the Museum of Modern Art and also included the showing of several foreign documentaries including excerpts from The Triumph of the Will by Leni Riefenstahl. Although it met with wide critical acclaim, many in the Hollywood community reacted negatively toward the film, and claimed that because it had been made by the government it was not therefore a documentary, but instead propaganda. None of the studios would agree to distribute it commercially. 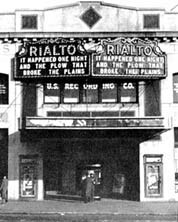 After traveling around the country with film in hand, Lorentz was finally able to convince the owner of the Rialto Theater in New York City to show the film. The enormous positive public reaction led other theater owners around the country to do the same. The Script for The Plow That Broke the Plains was much more spare than the script of The River. Lorentz did not sit down to write it until both the shooting and the score were complete. Similar in its poetic form to The River, The Plow That Broke the Plains was written in free verse and made use of a Walt Whitman-like repetition of words and phrases and the inclusion of many American place names. 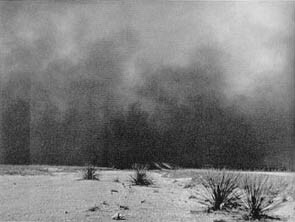 In his explanation of the circumstances that combined to create the Dust Bowl, Lorentz placed blame squarely on the shoulders of those that made unreasonable demands on the landscape and failed to conserve it. Lorentz charged that by focusing attention on the problems of Europeans, America had created problems for her own citizens. Only by returning to a more balanced relationship with the land, Lorentz made clear, would the plight of the residents of the Plains be solved. Lorentz asked his friend Thomas Chalmers, a former soloist with the Metropolitan Opera Company, to read the narration, as he was to do on The River. Chalmers deep, booming voice contributed a wonderful resonance and seriousness that worked well with the film's other elements. To get the footage that he wanted, Lorentz and his crew shot in Montana, Wyoming, Colorado, Kansas and Texas, where they captured the most powerful dust storm sequences. The people then living on the Plains were incredibly cooperative, and were happy to participate in a project crafted by someone willing to tell their story. Some of them received much needed cash from Lorentz for their assistance with the film. Lorentz felt that they added immeasurably to the project. "They still have enormous pride" he said at the time. "We stopped some and filmed them as they went by. When we talked to them we learned much of the cruel force that has blighted them." The location shooting became contentious when the professional cameramen and technicians clashed with Lorentz. Because he had never made a movie, he had difficulty communicating his ideas to them, and they were concerned with the sketchiness of the script from which they were working. Lorentz had not yet written the narration that was to accompany the film and that left the crew with little to go on beyond Lorentz' concept. They also had personal political differences. The cameramen were not as enthusiastic supporters of the New Deal as Lorentz was. 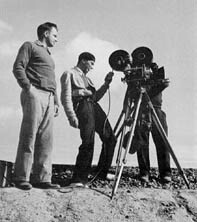 Lorentz eventually dismissed the crew with the intention that he would be able to buy stock footage from one of the studios to fill in the missing sections. However, he was initially blocked from buying this footage studio heads inside the Hollywood community who wanted to damage a project that they believed to be a propaganda effort of the part of Roosevelt. They instructed all the studios and film libraries to refuse Lorentz' requests for this footage. Through friends he was eventually able to obtain the stock footage required to finish the film. While he was in California dealing with this problem, Dorothea Lange helped Lorentz to set up a shoot of migrant workers arriving at a migrant work camp. He had enough money left in his budget for one day's shoot. Lorentz had so little of his budget left that he could not both hire an editor and pay for the score to be composed. Believing that the score was of ultimate importance, a belief that would prove correct, Lorentz decided to edit the film himself. He hired a woman to teach him how to edit film and set to work putting together The Plow That Broke the Plains. "From the beginning of my moviemaking years, even though I had never set foot in the cutting room or been behind a camera, I wished to keep control of the three elements of my film - pictures, music, and words - and to emphasize the elements in that order." Lorentz strongly believed that a score of equal power to the visual elements was necessary to tell the story that he hoped to tell. Lorentz interviewed twelve composers. Of the twelve, Virgil Thomson was the only one willing to work for just the money left in the budget. Thomson, a composer whose incorporation of traditional American folksongs and hymns into symphonic and orchestral music was to have tremendous influence on Aaron Copland, was a perfect choice. Thomson looked back to American history in a way that complimented Lorentz' personal philosophy. And, having grown up in Kansas, he had spent his childhood surrounded by the some of very landscape that Lorentz focused on in his film. "When he (Lorentz) gets the final recorded music track, then he goes back to the cutting room, finds inspiration for expressive visual narration through the musical detail, and wholly recuts his film." But the music did not just provide a thematic backdrop for the films visuals and narration. It also worked as commentary in its own right. The military marches and gunfire and tanks that accompanied a sequence of farmers plowing their land connected the contributions of the wartime farmers to those of the fighting men. This was not a theme addressed by either the narration or the visuals, and was communicated solely by the music. The score was recorded by the New York Philharmonic. Lorentz had so little money left in his budget that, on the day that they recorder the score, he was forced to stop the recording session at midnight because he could not afford to pay the Philharmonic members the overtime that would accrue if they continued after 12 o'clock. The musicians decided to complete the recording session for free. The opening sequence of The Plow That Broke the Plains will play below. It was selected because it is representative of both the artistic goals that Pare Lorentz sought to accomplish in the film as a whole - the use of iconographic images and poetic narration accompanied by a moving score, as well as the intellectual and patriotic argument that he was making - America was a great and plentiful nation, blessed with resources, whose conservation would help to alleviate the environmental problems that the nation was facing during the Depression. This section of the film details the settlement of the Great Plains. Special notice should be taken of Lorentz' transition from the opening map to the fields of the Plains, the wonderful shot of the single horseman, and the poetic repetition of the phrase "high winds and sun", foreshadowing the coming of the Dust Bowl. Also listen to Thomson's score, which works so well with the accompanying images. Please click on the film still below to start the RealVideo, and allow the film a few seconds to begin streaming.